Back in January of this year, archaeologists were able to unravel a fragment of the so-called Gospel of Mark, which is estimated to be the oldest gospel in existence. 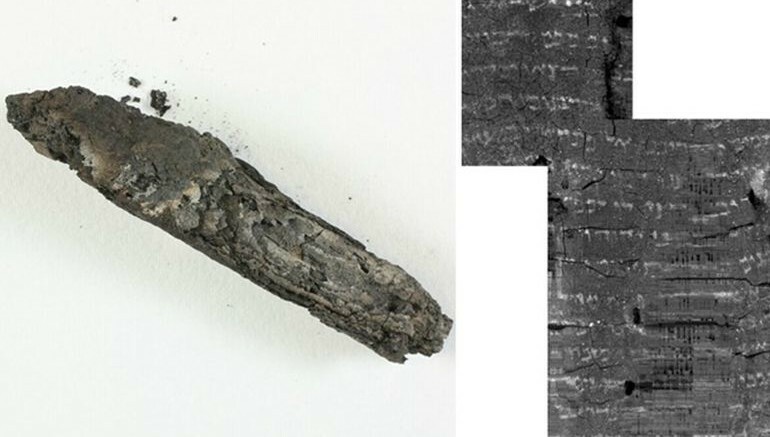 Interestingly, science played its crucial role in this delicate process of salvaging the fragment from a old papyrus sheet. And now, science seemingly has once again come to the rescue, with researchers successfully being able to decipher the oldest biblical text (after the Dead Sea Scrolls) with what can be termed as ‘virtual unwrapping’ software. According to Israel Antiquities Authority (IAA), this biblical passage comprises verses from the Book of Leviticus, and was found in a charred parchment scroll that was originally discovered 45 years ago. To that end, in 1970, the archaeologists came across this fascinating 2.7-inch scroll inside the synagogue at Ein Gedi (on the Dead Sea shore). The subsequent C14 analysis had revealed that this fragment dated from around 500 AD, thus corresponding to the 4th – 7th century Jewish settlement at Ein Gedi. This village originally boasted of quite a architectural specimens, including the aforementioned synagogue with its mosaic floors and the Holy Ark (an ornamented receptacle which contains each synagogue’s Torah scrolls). Unfortunately for the inhabitants, the thriving site was abandoned after a fire broke out that engulfed the major religious buildings. In spite of this state of dilapidation that almost existed for 1,500 years, the researchers (in 1970) were able to make a few discoveries by salvaging a bronze-made seven-branched candelabrum (called menorah), along with other items like – perfume vessels; ceramic oil lamps; glass pieces; 3,500 coins, and some charred scroll fragments. And now after 45 long years, IAA collaborated with with Merkel Technologies Company, Ltd. to use a micro-computed tomography machine for the analysis. This device produced some CT scans, which were then sent to Brent Seales of the University of Kentucky. The page actually comes from a layer buried deep within the many wraps of the scroll body, and is possible to view it only through the remarkable results of our software. We were certain it was just a shot in the dark but decided to try and scan the burnt scroll anyway. Now, not only can we bequeath the Dead Sea Scrolls to future generations, but also a part of the Bible from a Holy Ark of a 1,500-year old synagogue.